Dawn Publications (CA), 9781584691037, 66pp. When the weather changes daily, how do we really know that Earth's climate is changing? Here is the science behind the headlines - evidence from flowers, butterflies, birds, frogs, trees, glaciers and much more, gathered by scientists from all over the world, sometimes with assistance from young "citizen-scientists." And here is what young people, and their families and teachers, can do to learn about climate change and take action. Climate change is a critical and timely topic of deep concern, here told in an age-appropriate manner, with clarity and hope. Kids can make a difference! 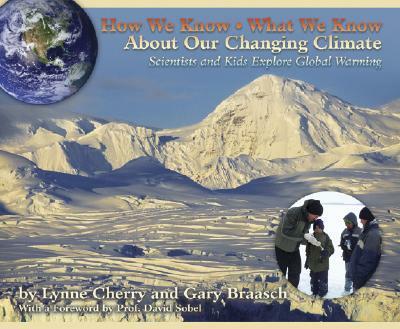 This book combines the talents of two uniquely qualified authors: Lynne Cherry, the leading children's environmental writer/illustrator and author of The Great Kapok Tree, and Gary Braasch, award-winning photojournalist and author of Earth Under Fire: How Global Warming is Changing the World.